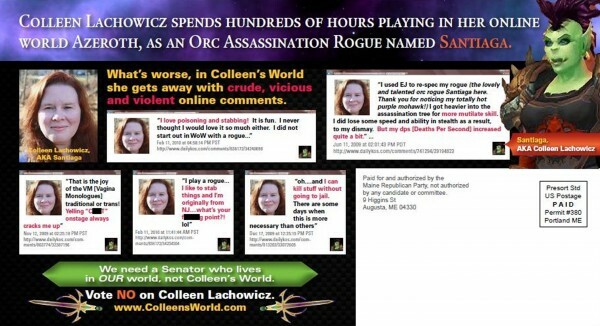 A mailer distributed by the Republican party which attacks Democratic state senate candidate Colleen Lachowicz for playing online games is seen in this handout image obtained by Reuters October 5, 2012. AUGUSTA, Maine — The Democratic state Senate candidate whose participation in the online game World of Warcraft became the subject of Republican Party attacks last month has been cleared of wrongdoing by the state ethics commission in response to a Republican complaint that she improperly coordinated with two political action committees to solicit campaign contributions. The Maine Republican Party had accused Colleen Lachowicz of Waterville of violating the Maine Clean Election Act by encouraging visitors to her website to contribute to two Democratic-leaning political action committees that were collecting contributions on her behalf through the website ActBlue. Lachowicz, who is challenging first-term Republican Sen. Tom Martin of Benton, is receiving public campaign funds under the Maine Clean Election Act and can’t accept campaign contributions. In a complaint filed with the Maine Ethics Commission, the Maine Republican Party accused Lachowicz of coordinating with the two political committees and said the contributions they collected through the ActBlue Web page — more than $6,300 as of Thursday morning — should count as contributions to Lachowicz, which would be illegal. The Republican Party’s early October attack on Lachowicz made an issue of online comments she had made using her World of Warcraft alias and her participation in the online, multiplayer game. The GOP campaign included a political mailer, a website and a Twitter profile. The World of Warcraft campaign quickly took off, attracting publicity from media outlets around the world. Amid that outpouring of media attention came countless expressions of support, Lachowicz told ethics commissioners Wednesday. Lachowicz said she posted the link to the ActBlue Web page on her website in response to a number of inquiries from people who wanted a way to show their support for her. Lachowicz said she played no role in setting up the ActBlue page and that she didn’t communicate with the political action committees collecting contributions. Ethics commissioners voted 5-0 in Lachowicz’s favor, declining to order an investigation into whether she improperly coordinated with the political action committees. While neither Lachowicz nor Martin can accept campaign contributions because they’re receiving public campaign funds, their race has become the fifth most expensive state Senate race in Maine this election cycle. As of late Thursday, Democratic- and Republican-allied groups, including the two political parties, had poured nearly $183,000 into the matchup, according to Maine Ethics Commission figures. The bulk of the funds, $81,000, have been spent opposing Martin.